Levy Creative Management artist KAKO is featured in Inspired Magazine’s 50 Inspirational Typographic Poster Designs. This poster was a collaboration with Kako & Graphic Designer Carlos Bêla. Carlos created the typography. To see all 50 Inspirational Poster Designs, go here. 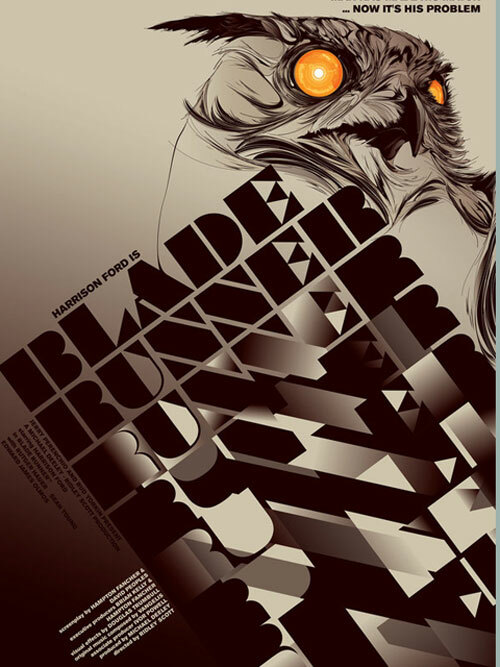 This poster was originally done for an exhibition called Now Showing – Exploring the Lost “Art” of the Film Poster, Kako didn’t think twice: he knew it was the right opportunity to finally work with designer Carlos Bêla and also knew that this could be his only chance to recreate the poster of his favorite movie, Ridley Scott’s Blade Runner. Do you like our owl?… It’s artificial?… Of course it is.